Bohol Power Investment Forums: The provincial Goverment, led by Governor Edgar M. Chatto who chairs the Bohol Energy Development Advisory Group (BEDAG), conducted the second Power Investment Forum last 16 March 2015, at Café Dolores, Tagbilaran City. The first forum was held last 10th February in same venue. To date, a total of eleven (11) private power generation/technology companies have presented their credentials and ideas on power investments for Bohol The Bohol Provincial Government Office of the Governor issued “Project Updates Technical Bulletin No. 1-2015” after that first forum. Please to Table 1 below for the list of the 11 companies that have presented in the two power forums. Sta. Clara Intl. Corp. Ongoing: 4 MW Hydro plant in Danao Plant site is within BOHECO 2 area. At least one company Noted that all questions he needed to ask in the forum were already answered by the presentation of Engr. Siga of the BEDAG-TWG. Bohol Island Power Development Plan: The Bohol Island Power Development Plan (BIPDP), as approved BEDAG and endorsed by the Bohol Provincial Development Council, has set the following as goals: (1) ensure power supply availability, reliability, and resiliency for the island and; (2) over time, reduce the cost of power to end-use consumers to a reasonable rate. The BIPDP, specifically its Power Supply Plan component, serves as the basic guide for the Provincial Government in promoting and facilitating the entry of new power investments in the island. Consistent with the BIPDP, the Provincial Government is encouraging the entry of power investments to meet the requirements of the island. Bohol Investment Policy: Consistent with the Revised Bohol Investment Code of 2014 (Bohol Provincial Ordinance 2014-015, the Provincial Government welcomes energy investments in the province that will promote optimal utilization of local resources and contribute significantly to socio-economic development of the province while ensuring strict compliance with national and local standards for environmental safety and sustainability. Energy has been identified as a priority investment area; qualified entities are therefor entitled to specific tax and non-fiscal incentives. To understand better the provisions of Bohol’s Investment Code, please visit the Bohol Investment Promotion Center website. National Government Policy and Guidelines on Energy Investments: The Department of Energy (DOE), which co-chairs the BEDAG, has issued the national policy concerning energy investments. Interested investors in Bohol are advised to refer first to national policy and be guided accordingly in securing appropriate certifications, accreditation, and other qualifications, as starting point. Please refer to the DOE Website for copies of the Energy Investor’s Guidebook and Energy Investment Kit. That is intended to serve the requirements of off-grid or other specific users in the island province. Please refer to the Bohol Island Power Development Plan (BIPDP) for information on the projected long-term power requirement of Bohol and the least-cost supply options that are envisioned to meet the goal of reducing electricity cost in Bohol. The prospective investors are advised to refer to the BIPDP to understand better the market for power in Bohol. 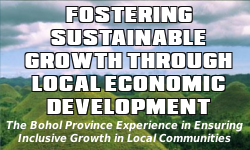 The Provincial LGU primarily serves as investment facilitator, consistent with the mandate provided in the Revised Bohol Investment Code (BIC) 2014. It is the entry point for all entities intending to invest in Bohol. It is necessary that investors have already familiarized themselves and obtained the relevant and necessary certifications, accreditations, and qualifications required at the national level and by the DOE prior to apply as new investor in Bohol. Approval by the City/Municipal LGU’s concerned for a business permit is a requirement for the investors to operate a business establishment in Bohol but it does not constitute a guarantee for the investor to obtain a Power Supply Agreement (PSA) with the DUs. Furthermore, neither the Office of the Provincial Governor, the Provincial Development Council nor the Sangguniang Panlalawigan are vested with responsibility and authority to manage, facilitate, or directly intervene in the future Competitive Power Supply Procurement Process (CPSP) of the DUs. Contracting a PSA with the DUs is purely private transaction with the investors. As of 6 May 2015, the Bohol Power Investments Coordinating Team has been created by Governor Chatto to ensure the provision of timely action on queries and concerns of prospective energy investors. The Team, headed by the Governor, includes the following members: 1.) Provincial Planning and Development Coordinator; 2.) Provincial Administrator; 3.) Provincial Legal Officer; 4.) BEDAG-TWG Head; and 5.) BIPC Head. The Team is tasked with preparing the “Detailed Guidelines for Bohol Power Investments” and responding to all queries and concerns of prospective power investors. To pump-prime the task of this Team in coming up with the detailed guidelines, the power companies that attended the 2 Power Forums and other interested prospective energy/power investors are enjoined to formally submit to the Bohol Power Investments Coordination Team, care of the Office of the Governor an Information Packet indicating their planned investment in Bohol. See Item E.1 for instructions. Please see Table 2 below for information to be provided. The Bohol Power Investments Coordination Team will forward the same information to the 3 DUs for their reference in inviting participants to the future Joint CPSP. Proposed Customer(s) — e.g. Sell to Grid; Sell to DU, etc. Proposed Financing Modality — e.g. privately financed, JV with LGU, JV with DU, etc. Consistent with the BIPDP, the 3 DUs intend to enter into long-term power supply agreements (PSA) with one or more generation companies. The planned Joint Competitive Power Supply Procurement (CPSP) is expected to attract prospective investors or generation companies (GenCos) that will competitively bid for the right to supply Bohol’s long-term baseload requirements for 2019 to 2039. GenCos that are planning to build their power facilities and secure a PSA in Bohol must participate in the CPSP process that will jointly be conducted by the 3 DUs. As of 6 May 2015, the 3 DUs: BOHECO 1, BOHECO 2, and Bohol Linght Company, Inc., have began preparing for this future Joint CPSP. The 3 DUs are forming an “aggregation entity” and have begun conceptualizing the parameters of their joint CPSP. The group will announce the particulars of the future CPSP in a subsequent Transaction Information Memorandum that will be issued start of year 2016. See below the Indicative Process Flow of the Joint CPSP by the 3 DUs. All potential investors that submit their credentials (Information Packet) to the Bohol Power Investments Coordination Team are assured to be invited to the future CPSP. The BEDAG, thought he Office of the Governor, shall issue a subsequent bulletin to update the interested parties on the Joint CPSP. May we know the status of this project as we interested to join the bidding. Our power company is JV Adnama Mining Resource Inc. (AMRI) and China New Energy. Mr. Fernando “Ding” Borja is the president of AMRI. One Bohol Power (composed of BOHECO I, BOHECO II and Bohol Light, Co., Inc. (BLCI) have organized a Procurement Board and Bids and Awards Committee that will conduct the bidding by August 2017, hopefully. Bidders are private companies engaged in power generation (solar, hydro, wind, liquefied natural gas, bio-mass, coal, diesel). If you are interested, you may contact any of the following of the One Bohol Power Project (Joint BOHECO I & II) at tel. no. (038) 508-9731 or through email at boheco_main@yahoo.com. Look for Engr. Dino Nicolas Roxas, Engr. Danilo Quidlat, or Engr. Algerico Siga.